While there are numerous books about whisky, there are surprisingly few about how to make it, and even fewer about how the whisky industry itself looks at whisky as a thing to be sold. There are books of tasting notes, history and even romantic looks at the world of whisky, some of which we’ve covered in the past in our Classic Book Reviews series, but there are only a handful of more academic looks into whisky production and marketing – the last major work was the expensive and now hard to find Whisky: Technology, Production and Marketing from a decade ago. With the world lacking an up-to-date guide for the academic world (and interested whisky fans), a new book was needed. 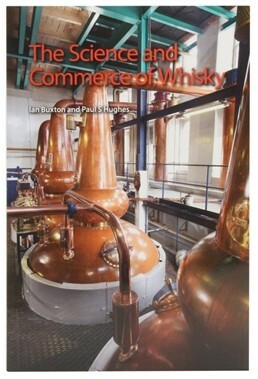 Step forward Ian Buxton and Paul S Hughes, and their 2014 book – The Science and Commerce of Whisky. Ian is not entirely unknown to us, prolific writer and frequent guest at the Whisky Show as he is. He is also responsible for the reprinting of one of the books in the aforementioned Classic Book Reviews series – Whisky by Aeneas MacDonald. Ian’s background in whisky marketing, and his more recent consulting and writing work, made him the ideal person for the Royal Society of Chemistry to approach to put together a new, more technical book about whisky production, other than for one thing – Ian is not a technical guy. Fortunately, he knows Paul Hughes, Professor of Brewing and Distilling at Heriot Watt University in Edinburgh, head of the most prestigious brewing and distilling course in the UK. Splitting the book up between them, Ian has taken on the historical and commerce-related chapters, while Paul has explored the science of whisky production, producing a work with three quite distinct sections. Ian’s opening historical chapters are an excellent overview of the history of whisky around the world. Starting from the alchemists of the 13th century, he continues through the development of Japanese and American spirit, as well as the explosion of world whisky. Scotland is split out into a separate chapter and the history of Scotch whisky is given a detailed examination. The chapter moves forward through time, describing the development of the modern whisky industry from its mythical Friar-Jon-Cor-based beginnings to its modern incarnation, and is both a comprehensive summary and an excellent jumping-off point for further research. At this point, the subject matter of the book moves squarely into a realm that I’m very out of practice with: chemistry. The central third of the book is given over to Paul Hughes, and requires at least A-level knowledge of the subject to get the most out of it. It can be a bit overwhelming for us part-time science geeks, but I generally followed what was going on, and a nearby encyclopedia or internet connection can fill in many of the gaps. Covering the whole whisky production process from crop to cask, there were a few areas where I felt it was a little lighter in detail, especially spirit condensation and, strangely, distillation itself. However, there’s enough here to keep a brewing and distilling student happy, let alone an interested drinker, and I suspect the focus is on the Heriot Watt Brewing and Distilling course’s syllabus. The final third of the book deals with the commercial side of whisky, covering subjects as diverse as counterfeiting, tax and packaging, as well as general brand development and marketing, complete with case studies. The last two chapters expand that thinking into the world whisky market, with case studies looking at Teerenpeli in Finland and Kavalan in Taiwan, as well as showing how it all fits together into a global whole. For someone working in the whisky industry, much of this is quite well known, but for those looking in from the outside with a romantic view of how and why whisky is made, it might be a bit of a shock. All in all, this is one for the students and geeks. It’s an academic textbook that covers large amounts of ground – historic, economic and scientific – and does so in some depth. For those areas where there isn’t enough detail there is an extensive bibliography, and even a useful chapter on whisky literature, in case you are looking for jumping off points for further reading. A scary book in parts, but also approachable – very much a game of two enjoyable and informative halves. The Science and Commerce of Whisky is now available from The Whisky Exchange, priced £27.99.